We found a treasure while taking a stroll on Montana Avenue in Santa Monica that we had to share with you! Whether your pregnant, a new mother, or looking for a gift, this is the store for you! They have beautiful things for everyone, including toys, books and smart accessories for all! We found the most adorable infant multi-colored scarves for our twins, not to mention tons of Christmas gear such as pajamas, clothing, loungewear and bath gear. 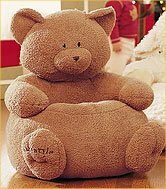 And the most loved present was the teddy bear chair THAT WE JUST LOVE! !